The former chairman of the Federal Reserve loves baseball, has a sense of humor and is open about past mistakes. The former chairman of the Federal Reserve who arguably saved the U.S. economy from another Great Depression is now a civilian, serving as a senior advisor to two big financial firms – PIMCO and Citadel – writing a blog and making appearances at corporate events. At LPL’s national conference held in Boston this week, Ben Bernanke sat on stage for an interview with the firm’s chief investment officer, Burt White. He told a few funny stories — stories I’ve heard he’s told before — and answered questions about the economy and, of course, Fed policy. And in the course of an hour or so he revealed some things that may surprise you. The 9/11 attack on New York’s World Trade Center inspired Bernanke, then the chairman of Princeton’s economics department, to join the Fed. He wanted to get involved in public service and says, he asked himself: What is good about economics? His answer: to help people live better lives. Bernanke stayed on as a governor on the Fed board until Bush appointed him chairman of the Council of Economic Advisers, which was apparently a tryout for his role as chairman of the Federal Reserve. About six months later, Bush nominated him to chair the Federal Reserve Board. Although Bernanke is given a lot of credit for preventing the Great Recession of 2007–2009 from turning into the Great Depression, which he studied as an academic, he didn’t recognize the dangers early on. By that time the mortgage giant Freddie Mac was no longer buying the most risky subprime loans, subprime mortgage lender New Century Financial was on the verge of bankruptcy and mortgage foreclosures were rising rapidly. Bernanke says he testified 79 times before Congress during his eight years as Fed chairman. That’s almost 10 times a year. Given that Congress is in session an average 145 days a year, that’s testifying about every 15 days on average. About his Washington experience, Bernanke said, “As bad as you think public policy is, it’s worse.” But he’s not bitter or surprised. “If you’re working on policy you have to be scrutinized… ‘It is important for all policymakers to explain why they’re doing what they’re doing and to be ready to accept criticism and scrutiny,” said Bernanke. He added that those who aren’t comfortable with that shouldn’t be involved in public policy. Bernanke served two terms as Fed chairman under two presidents. (President Barack Obama renominated him in early 2010). He left after his last term ended in early 2014. At his going-away party at the Fed, Bernanke said the staff presented a baseball card with his picture on it and the stats of his Fed career, including the number of times he went before Congress. Turns out Bernanke loves baseball and is a regular at Washington Nationals games. “All economists love baseball statistics, which go back to the 1880s,” he said. And he seems to love the story he tells about talking with Nationals right fielder Jason Werth at the ballpark. When he was taken around by former manager Davey Johnson to meet the players, Werth, who’s 6-foot-6 and towers over the Fed chairman, asked, “ ‘What’s the deal with QE? “ referring to the Fed’s quantitative easing policy of buying U.S. Treasuries and mortgage-backed securities to stimulate growth. The LPL audience laughed. Bernanke also recalled his lunch with actor Paul Giametti, who played Bernanke in the HBO movie “Too Big to Fail,” about the financial crisis. They talked about baseball because Giametti’s father, Bart, had been baseball commissioner. The Jason Werth story wasn’t the only one that got laughs at the LPL conference. Here’s another: Bernanke recalled the criticism the Fed received including one from Rep. Ron Paul, R-Texas, who also advised people to invest in gold because Fed policy would lead to runaway inflation. “How has that worked out for you?” The audience clapped. Hundreds of books have been written about the financial crisis, including books by two Treasury secretaries, who are members of the Federal Reserve Board. 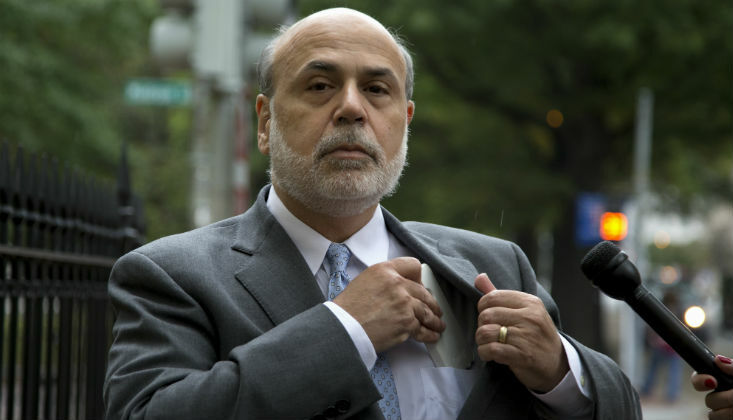 Now Bernanke, probably the single most important policymaker during the crisis, has his own. “The Courage to Act: A Memoir of a Crisis and Its Aftermath” is scheduled to be released on Oct. 5.